Shane Lowry right with Simply Golf CEO Colm Daly (right) and PGA professional Bernard Quigley (left) at the launch at the Dean Hotel on Harcourt Street in Dublin. Shane Lowry has always distinguished himself as a fearless competitor but giving up the chance to ease his pre-Masters nerves with an early visit to Augusta National must rank as one of his boldest decisions so far. Currently ranked 44th in the world and flying high on the confidence of three seemingly effortless Top 25 PGA Tour finishes in a row, the 27-year old Offaly man is not approaching in his Masters debut like a man simply going there for the experience but of a highly competitive sportsman hoping to make an impact. Fully recovered from the disappointment of the bogey-bogey finish that cost him around $66,000 as he shared 17th in the WGC-Cadillac Championship on Sunday, Lowry was back in Dublin to launch a new smartphone app (iTunes link) that has the potential to crack the US market in golf tuition. “I think I will be coming back from the Masters with my US tour card in my pocket,” said Lowry, who is an official ambassador for Simply Golf, an app that uses geo-locational technology similar to Hailo to allow amateurs to book a golf lesson with a top golf pro in 60 seconds or less. “Finishing with two bogeys, that hurt me a bit on Sunday. It was tough to take because I know I am quite close to it. I am still only one good week away from making my card over there but I have been thinking about it but in a good way. “I’ve been doing the right things on an off the course and I never put as much into my golf. I am always prepared to play and always prepared to do well. Lowry had planned to head to Augusta National on the Wednesday before the Masters for a two-day reconnaissance mission but he will now remain in Lake Nona that week to practice. He plays the Arnold Palmer Invitational at Bay Hill next week, followed by the Texas Valero Open and then returns to his temporary base at the Orlando resort to get ready for his Masters debut with his coach Neil Manchip. “I just want to arrive on Sunday, have a look around, get out there and play and just enjoy the week,” Lowry said, cleary determined to go about things his own way, as he has always done. “I feel going up to Augusta the week beforehand, trying to get to know the course, is just trying a bit too hard. Lowry sees no reason why a rookie can’t win the Masters but while he tries to play down the tension of the event in his own mind, Pádraig Harrington put him straight on one aspect of the season's opening major when they had dinner on the eve of his Honda Classic playoff win eight days ago. “One thing Pádraig said to me about the Masters was, ‘It’s everything you expect and more,’ because I said to him that I was nearly looking forward more to The Open at St Andrews this year,” Lowry said. Lowry plans to have his father Brendan caddie for him in the Par-3 Contest and he’ll be targeting victory in that too, despite the fact that no winner of the pre-Masters event has ever donned the green jacket that week. “What’s the point in going if you don’t think you can win,” he said. “This thing of rookies can’t win the Masters or if you win the Par-Three you wont win the Masters. I think that’s all coincidences. If I play good enough golf, I know I can win that week. End of. If I don’t play well enough, I won’t win. To mark the launch, Simply Golf is offering 1,000 free golf lessons to the first 1,000 people to go to SimplyGolf.com or download the app from the Apple Store and book a lesson. Colm Daly, CEO of Simply Golf said: “Our mission is simple — to change the way the world learns the game of golf and to make it easier for the average golfer to get better at golf. “We are very proud to kick off the global launch of the Simply Golf product in Ireland before entering the $1 Billion U.S. golf tuition market this summer. The app looks fantastic and while it is not restricted to PGA professionals, the strict vetting procedures, the rating (star) system use to review performance and prices determined by market forces are all pluses. It's also an ideal platform for PGA pros to fill in their dairies and attract clients who might otherwise feel intimidated by walking into a golf club or driving range to ask about lessons. Some pros may offer special promotional rates at quiet times. A 30 minute lesson at a nearby course could cost around €30 and with the pro unable to "close" the lesson on the app without providing notes on the tips he or she gave, it will allow golfers to keep a handy record of what they were told. The app is available for Apple with an Android version due before the end of April. The developers plan to expand into the huge US market in phases over the next year with golf-mad states Florida, the Carolinas, California, Texas and New York the first to be targeted. While Ireland has around 550 teaching professionals, there are more than 30,000 in the US. Shane Lowry insists he needs to loosen up and stop trying to be Mr Perfect in his bid for Masters glory. Shane Lowry and Phil Mickelson might be like chalk and cheese but the short game wizards love nothing better than a crack at attack at Augusta National. Shane Lowry has been left speechless by the magic of the Masters. But while the Clara star is also keen to make his voice heard when the action starts today, he knows that he has to accept that he won’t get everything right on his first competitive trip around Augusta National. Shane Lowry has told his GAA legend dad to stop tipping him for Major glory. 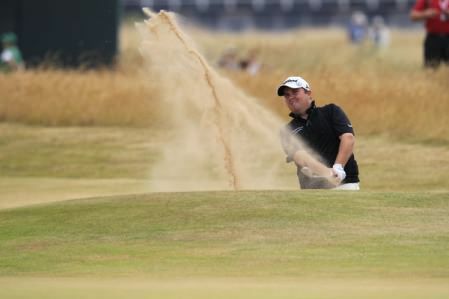 Shane Lowry blasts out of a bunker during round four of the Open. Picture Eoin Clarke www.golffile.ieShane Lowry left Muirfield convinced that he has the game to become a major championship contender some day.